IK Multimedia has been quite successful with their iRig line of products, giving musicians easy and affordable ways to record and perform anywhere they go with professional sound quality. The IK Multimedia iRig Pro Duo expands their lineup with dual high quality XLR/TRS inputs with 48V phantom power and 24-bit audio for studio-level recording. Recently, we reviewed the IK Multimedia iRig Acoustic Stage, which scored excellently in our review thanks to its great value for money. At $199, the IK Multimedia iRig Pro Duo interface could be a great hub for mobile projects if the quality stands up to other mobile recording options, so we tested it to see how it holds up. The IK Multimedia iRig Pro Duo is slick and simple interface that packs power in a portable design. The easy to use layout makes plugging in instruments and microphones a breeze. The duo has a plastic build which keeps it light and mobile (under seven ounces in weight), although it could benefit from a stronger material. Individual gain knobs are front and center with indicator lights for gain, phantom power and MIDI input. Two 1/4” outputs are on the left of the device along with an output level control and phantom power switch. On the right is a switch for direct monitoring of audio, a headphone jack and a volume control. 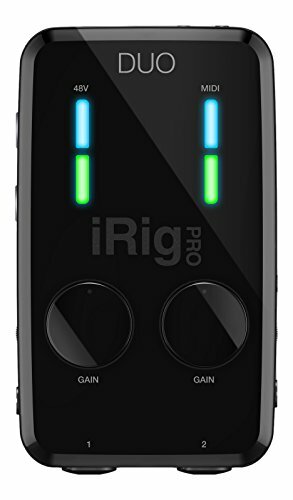 The top of the iRig Pro Duo is where the main connections sit, including a multi-connector to lightning (iOS devices), micro-USB (Android) or a standard USB cable (Mac and PC), MIDI input and output, and DC power. Power can come from USB, the DC input or by two AA batteries in the bottom of the device. It is apparent that IK Multimedia focused on keeping the IK Multimedia iRig Pro Duo easy to use, whether it’s your first use and just using a simple instrument input or you’re making use of all possible connections. I found the gain knobs to be perfect for dialing in the right signal. The indicator lights were simple to watch for monitoring input levels and are quick to respond to changes. Although the iRig is plastic, it still held up well when quickly changing out input and output cables. We loved being able to toss the IK Multimedia iRig Pro Duo into a tiny bag with a cable or two and be able to record anywhere we wanted. We tried bringing the iRig out to the park with a guitar and instrument cable for some laid-back jamming and improvisation. The ease of sticking some rechargeable AA batteries in and connecting to GarageBand on iPhone made this experience seamless and perfect for impromptu recording. In another test case, We brought the iRig to record some conversation in a conference room. Using a quality phantom powered microphone with omnidirectional capturing made it easier that ever before to hear everyone in the room and send copies of the recording afterwards right off an iPad. One small annoyance on the iRig is the phantom power and direct monitoring switches. When we had headphones in monitoring sound we hoped there would be a better ‘click’ feel to the switches. Another small issue we had was the multi-connector to the recording device feeling a little loose. A time or two while we were adjusting controls on the iRig, the device disconnected from the computer when nudged a bit. We find interfaces with a solid snap-in connector to be a more reliable connection. While the iRig may be one of the simplest ways to record dual inputs, it also sports great sound quality. Recording 24-bit audio into an digital audio workstation on Mac was impressive. The plug-and-play ability made it easy to connect and record instantly. Testing the iRig with a Fender Stratocaster sounded fantastic direct in, and was even better when putting a nice amp simulator in the chain like IK Multimedia’s AmpliTube. When testing the phantom powered microphone in a conference room, we realized the audio level was much lower than we intended to record at, but we were able to gain up the audio a whole 30dB without much noise issues. The preamps in the iRig are quite clean and don’t add any unwanted coloring.